The big news in town was the strong opposition towards the hospital's opt-out plan. The credibility of Trust status was challenged by the council who opposed every part of the bid and claimed that the Health Care Unit, and in particular their chief executive Maggie Aikman, had totally failed to convince them that Trust status would offer any benefits which couldn't be provided by a directly managed unit. The North West Regional Heath Authority then took the unprecedented step of inviting members of the public to make their views known in a huge consultation exercise. Local folk delivered them a crushing blow with only 20 of the 3,162 responses in favour. All of the remaining 3,142 were against. The council had also dealt blows to two planning applications. After opposition led by MP Peter Pike, they turned down the application for a wind farm at Coal Clough Farm, Long Causeway, Cliviger and deferred any decision on the proposed canal park at Rosegrove. The company proposing the wind farm immediately said they would lodge an appeal but the lack of a decision from the Planning & Environment Committee regarding the canal park was seen as a major setback. In the world of cricket, there was a young Australian bowler playing in the Lancashire League in 1991 by the name of Shane Warne and he'd just played against both of the local clubs, Burnley and Lowerhouse. He, personally, had a decent day against Lowerhouse, taking 6/27 but wasn't quite successful against Burnley where he ended with just 1/72. Warne was on the losing side in both games. Despite his bowling performance at Lowerhouse, Accrington found themselves undone by a couple of the home team youngsters. Chris Blezard hit 75 with the bat and James Capstick took 4/26 including the wicket of Warne who he bowled for 18. Trevor Little, Duncan Spencer and Jon Harvey all hit half centuries against Warne's Accrington the day after. He got Spencer's wicket in what was his last game for Accrington. Back at the beginning of the season the same Burnley batsman, grandson of former Claret Harold Spencer, was also Warne's first Lancashire League wicket. A letter to the Burnley Express from aggravated Clarets fan Mark Neary hit out at the club when they refused to give him itemised details of how the money raised from the 'Clarets Revival' draw was allocated. He felt it should all go towards buying players and not towards the running of the club. "Cardiff City paid £300,000 for three players on 2,000 gates," he said. "We have held lottery cards, plus the Clarets Revival, and we still cannot compete with the likes of the above club and it does make one wonder how Cardiff City manages to do it doesn't it?" In further correspondence, a Mr O'Neill from Blackpool suggested that with the Soviet Union going through a tumultuous revolution, Burnley should be looking for their own Boris Yeltsin. "It's time the fans of Burnley challenged the dead wood regime at Turf Moor. Not by staging a coup which might last as long as a fruit gum, but rather by looking for a figure of stature who will stand up and say 'things must change' and 'there is no going back' - in other words, Burnley's answer to Boris Yeltsin. So come on Burnley. Where is your Boris?" 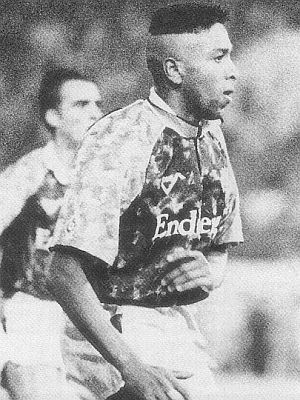 Despite all the criticism, September started with a bang and Roger Eli provided the dynamite with the club's first hat trick in more than six seasons. Chesterfield were the helpless victims at Turf Moor. Mike Conroy had been the name on everyone's lips and his goals at Doncaster meant he'd scored in his first three league appearances for Burnley, becoming only the fifth player to achieve that in Burnley colours. He joined a group that included his Burnley manager Frank Casper who also achieved the feat in 1967. On this night it was very much Eli. He started it with a controversial goal and ended it with a somewhat fortunate third as Burnley dominated the game and fully deserved the points against the Spirites. John Francis and Mike Conroy, Eli's partners in attack, both turned in terrific performances, but this was Eli's night and he stole the show with a typical display that had become his hallmark. It all started when the ball broke for Conroy on the right and he found ELI in there. The striker made no mistake from close range but he had a look for a flag, there was none waving and it was time to celebrate. Referee Phillips did consult with his linesman, who had initially raised his flag against Francis before putting it back down. More protests followed from the Chesterfield players, but the decision was not going to be reversed, Burnley led 1-0. Burnley were playing some magnificent football and Conroy and Francis linked up in a move that nearly brought a memorable goal. Conroy played a through ball for Francis who twice flicked the ball up before hitting a volley that fizzed just wide. It was clever stuff from Francis - it would have been some goal. 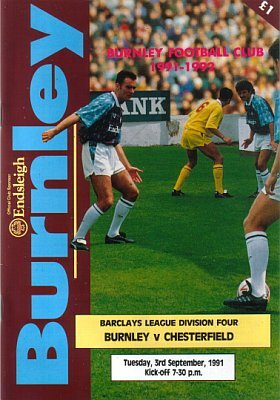 John Pender, Mark Yates and Conroy himself all went close in a first half dominated by Burnley although Andy Marriott, like Yates making a home debut, had a couple of speculative efforts to deal with. The second half started with Burnley on top again. Sean Dyche did really well just a couple of minutes in to cut out a Francis cross and then Steve Harper, playing at full back, went on a 50-yard run before almost finding Yates with a cross. Just seven minutes into the half Burnley doubled their lead. Steve Davis played a ball forward that was headed on by Conroy to ELI who was blocked by Brien, but not for long, he was so strong. He got through - good save by Leonard, but he couldn't stop the second one, 2-0. Marriott was forced into one brilliant save before Burnley wrapped it all up. John Deary took a corner on the right at the cricket field end. It came through for Francis who shot, it was deflected and in. John Francis had made it 3-0. But Roger ELI was celebrating and I think that meant Eli's hat trick. He was claiming it you know. Right at the end, Conroy almost wrote his name in Burnley history by scoring in his first four games, but goalkeeper Leonard made an outstanding save to deny him. Never mind, a third win had seen Burnley climb to second in the table, just one point behind leaders Crewe who were due at Turf Moor four days later. Nine goals had been scored in the three wins and the quality of football was outstanding. The Burnley fans gave their team a fully deserved ovation at the final whistle. Burnley: Andy Marriott, David Hamilton, Steve Harper, Steve Davis, John Pender, Mark Monington, Roger Eli, John Deary, John Francis, Mike Conroy, Mark Yates. Subs not used: Andy Farrell, Ian Bray. Chesterfield: Mick Leonard, Sean Dyche, Steven Williams, Lee Francis, Tony Brien, Paul McGugan, Bryn Gunn, John Cooke, Dave Lancaster, Neil Grayson, Dave Caldwell (Gary Evans 27). Sub not used: Iain Dunn. With Crewe on 10 points at the top, Burnley headed a group of five clubs on 9 points courtesy of our goal difference. Barnet, Hereford, Rotherham and Blackpool were the others. Top of the league Crewe had beaten Aldershot 4-0 at home but Barnet were the biggest midweek scorers, hitting no less than six without reply at Lincoln City. Gary Bull hit another brace for the league's newcomers. And a well done to Maidstone United who collected their first point of the season with a 1-1 home draw against Cardiff City courtesy of a Steve Cuggy penalty.